One thing you will always find served at Galaxy Bakery and Coffee House is the same great quality. Ike and Jen pride themselves on that. They only want to give their family the best! All jams and icings are home-made, they never come out of a jar. Galaxy always uses real butter, never shortening. Eggs are purchased locally from Hallsome Farms in Walburg. The Cuvee coffee is locally roasted in Spicewood, Texas. 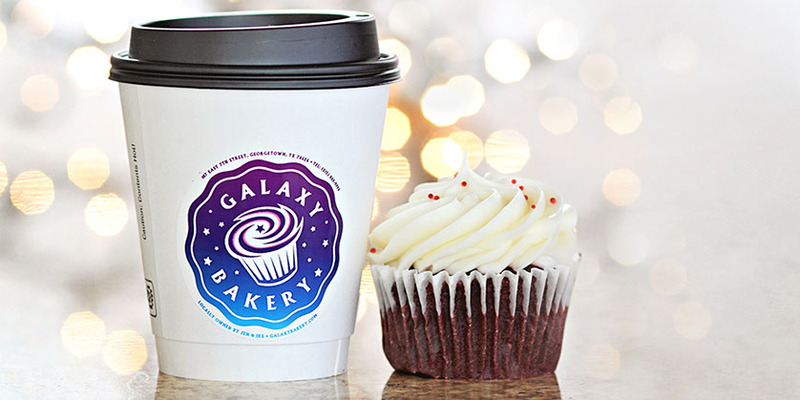 Galaxy is well-known for its scrumptious cupcakes, but they also offer muffins, quiches, cheesecakes, croissants, scones, and cookies. The cupcake menu changes bi-weekly, with the exception of the universal favorites: chocolate, vanilla, strawberry, lemon, red velvet, and Hostess. Ike’s bread is famous with friends and family. It’s a true artisan sourdough bread, baked with no dough conditioners and is naturally leavened. Chocolate, Confectioners Sugar, and Pistachio. Chocolate Brownie, Chocolate Chunk, Cranberry Oatmeal Walnut, Peanut Butter, and Sugar. Almond, Dutch Apple, Peach Cobbler, Cherry Cobbler, Chocolate, Ham & Swiss, Jalapeño Sausage & Cheddar, Raspberry, Sausage & Cheddar, Spinach & Feta, Jalapeño Popper, Boston Cream, Turkey Gouda, and Almond Joy. Blueberry, Lemon Crunch, Maple Walnut, Raspberry. Almond, Blueberry, Cranberry Orange, Raspberry.